After decades of unrest and uncertainty, this beleaguered nation is poised to reclaim its title as one of Africa’s most spectacular, diverse and popular travel destinations. One of the Seven Natural Wonders of the World, Victoria Falls (The Smoke that Thunders) weathered the political storm of recent decades better than other parts of Zimbabwe. It now offers a ground-shaking curtain-raiser (or grand finale) to a wider-ranging exploration of this beautiful country. Our Zimbabwe holidays combine the sights and activities of Victoria Falls with safaris in superb wildlife destinations like Hwange National Park – renowned for its elephant herds. Other highlights include Mana Pools National Park for walking safaris or canoe trips along the Zambezi River, and Matobo Hills National Park for a surreal landscape scattered with balancing granite boulders and daubed with Bushman rock art. 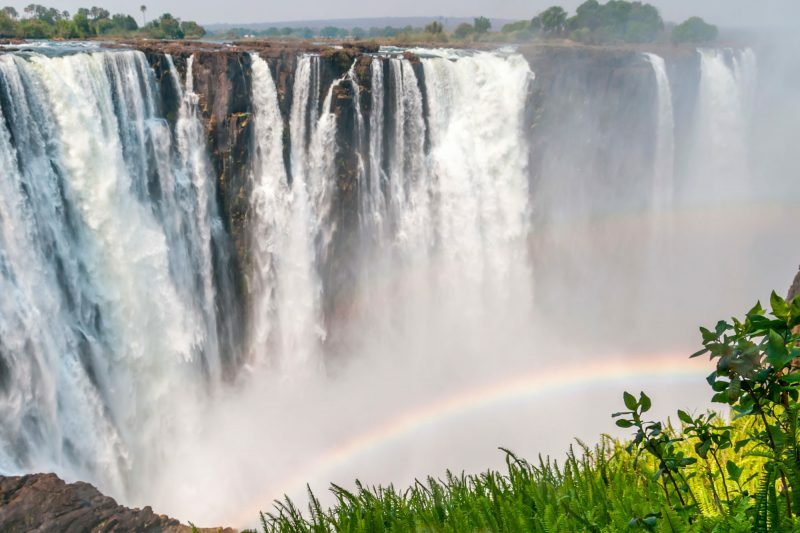 Over 100m high and 1.7km wide, the world heritage site of Victoria Falls gushes 550 million litres of water every minute during peak flow (February to May), creating a column of spray that can be seen from 50km away. Roughly twice the height of Niagara Falls, it is the undisputed adventure capital of Africa. Hop in a helicopter for a ‘Flight of the Angels’, bungee off Victoria Falls Bridge or raft the rapids in Batoka Gorge downstream of the falls. Zambezi boat cruises and canoeing trips offer a more sedate experience – and an excellent opportunity to observe elephants and other wildlife – while the grand old Victoria Falls Hotel still offers high tea overlooking manicured lawns. Zimbabwe’s largest national park, Hwange covers 14,600 square kilometres of Kalahari scrub, granite hills and mopane forest. Over 100 mammal species are found there, including elephant, rhino, lion and leopard. Easily accessible, it’s typically a three-hour drive from Victoria Falls depending on your camp. As well as day and night game drives, most offer walking safaris. The Shona word for ‘four’, Mana refers to the number of oxbow lakes in this stunning national park. Located downstream of Lake Kariba, where the Zambezi meanders through a broad rift valley, Mana Pools is best visited on a fly-in safari from Victoria Falls or Harare. Game drives and canoeing trips provide incredible encounters with large herds of buffalo and elephant, as well as several antelope species and healthy populations of wild dog and lion. As with all of Zimbabwe’s national parks, the standard of guiding is excellent – a walking safari is highly recommended here.